I recently moved to Birmingham and needed some general maintenance done. Took it to the dealership and decided to get it detailed which included a basic exterior wash and wax. 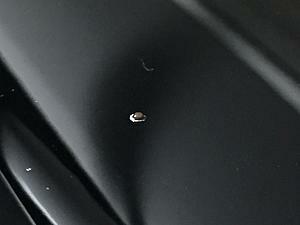 A couple of days after getting it back I noticed a small raised spot and thought it was just something that stuck to the car so I picked at it and it popped off exposing a paint chip where I don’t recall there being any chips. So I then inspected the rest of the car and found several more. I’m OCD about my car and know that these were not there before the Lexus detail. Can anyone tell me what this appears to be? Did someone in the detail shop use a paint pen or something else to cover up rock chips? Would need more pics to see but I doubt anyone would do that for a basic wash detail. What sections of the car are these raised spots located at? Based on that one picture, that is NO paint touch up. Even the most sloppy paint touchup (with a big blob)would not look remotely like that. I wonder if it's some kind of contaminant. That almost looks like some kind of either acid drop, hot epoxy drop, or something else of that nature that bonded with the paint and damaged the paint underneath, hence why the actual car's paint "chipped" off the base metal when you picked at these spots. If you've ever seen cement splatter on paint that's left to harden, sometimes you can't remove it completely without destroying the paint and if you do remove it, if it sat long enough it can easily pick up the paint as well. Is it possible you drove behind a truck/vehicle that had something leaking out of it and some of these specs landed on your car?